Why I Love Tubes of Stuff. 1) They’re lightweight. I’m a constant traveller and I can’t be doing with heavy glass jars and silver-lidded tubs! I’m forever decanting things from one pot to the next, getting creams all over the place and spilling precious, expensive serums onto the carpet. 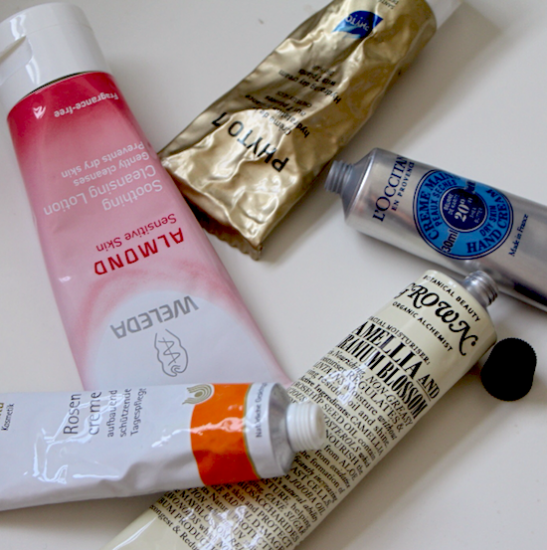 I’d like everyone to start making a version of everything in a tube. 2) There’s no terribly shameful wastage. You squeeze as much as you can out of the tube (though sometimes not quite enough, see cons below) and then you’re just left with this sad, empty skin and a little plastic cap. Much easier on the bin than a humungous plastic pot. 3) They keep things quite fresh – not much product really comes into contact with the air, and, if it does, you just nip off the dried-up manky bit and start anew. 4) They keep product quite germ-free – rather than sticking your (possibly) filthy fingers into a pot of pricey face cream, you just squeeze out a small amount and apply. The rest of the cream stays perfectly clean! 5) They’re non-bulky and you can cram LOADS of them into your makeup bag. Loads. You don’t have to worry about them smashing or breaking – though…see below. 1) They don’t smash or break, but now and again they do split or burst. Tubes love to burst! Especially if you cram LOADS of them into your makeup bag..
3) Sometimes, or always if you’re on a plane, your tube of product will decide that it has to empty itself of its contents as soon as you unscrew the cap. Like something out of an exorcism session, it will spew product out in an endless stream for many seconds, delivering itself all over the ceiling and your lap, until you’ve managed to fumble about for the cap and stem the flow. Blistex’s original Relief Cream is an expert at doing this and will squirt out a fine, relentless arc of tingly lip treatment until you recover from the shock and fix the lid back on. Weleda’s Almond Cleansing Lotion. So many cleansers come in hefty bottles so it’s great to find a gentle, creamy one that’s packaged well and doesn’t weigh down the old travel bag! It costs £8.95 with free delivery here. Phyto 7 Hydrating Day Cream with 7 Plants. This is actually a hair moisturiser, not a facial one, and it’s brilliant for helping to smooth and de-frizz dry ends without adding greasiness or heaviness. If you don’t like the slippery feel of serums or if you want to nourish rather than quick-fix, this is a great cream to keep with you – you can either apply sparingly to the ends or use pre-drying to give great condition and shine. It costs £13.50 with free delivery here. The Camellia and Geranium Blossom facial moisturiser from Grown Alchemist: a gorgeous, rich, non-greasy moisturiser that’s perfect for in-flight facials and dull, winter skin. I’ve only recently tried this, so will try to do a full review, but I can’t seem to find this product anywhere online. The brand is stocked at Brummells of London, but I can’t find this specific cream. Do let me know if you spot otherwise. Previous Post Reader Offer: Free Jo Malone Sample!